For the past few months I’ve been trying to potty train my 3 year old. 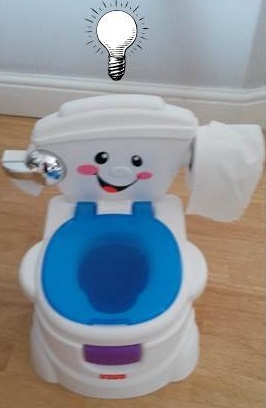 A friend of mine who has 6 children and a good knowledge of the 3 Principles told me that potty training is just like thinking in the sense that when we are ready to drop thought we just drop it. It’s not something we can make ourselves do – ie If you’re in a bad mood or have negative thinking about something the more you tell yourself to stop thinking about it the more you think about it! – Just so with potty training. If a child is ready to go to the toilet they are ready and no amount of cajoling bribing and anything else can make them. I’ve discovered this is very true! The nursery my son went to was encouraging me to potty train him a few months ago when the baby was born and even though we had misgivings about it, we tried but he just didn’t seem to care if weed or poohed wherever he was. Despite trying to encourage him onto the potty with sweets and other incentives he just wasn’t interested. So we put him in pull ups and just took him to the toilet regularly. A few weeks ago he heard me and a friend talking about how that now he was going to nursery in a big school soon he needed to wear pants because there would be so many children there etc. That afternoon he asked to wear pants and has not gone back. Yes we have had a few accidents watering the floor of a well-known supermarket but these things happen. The difference is now he is ready. Something clicked inside of him and he got it. He really wants to do it and doesn’t fight when we ask him to go the potty or toilet and takes pride in his achievements as well as joy in the treats we give him. In fact he’s getting so good that we are having to find a way to cut back on the sweets as an incentive! This time round we were also ready so everyone was committed to the outcome from a good feeling of genuinely wanting it to happen, rather than a feeling of having to do it because it’s expected of him and us as parents. For me this is such a great example of the 3 Principles in action. We can really want to be able to see certain aspects of our lives differently, but we can’t seem to be able to make ourselves do this. This can last a few minutes an hour or maybe even a few months. Until we can see that we are creating our experience of the situation and not beat ourselves up about it (because that just embeds it more) and just be accepting of ourselves then it has no chance of dropping away and a fresh insight or change of thought occurring to us. When we are ready, an insight will come and it will be effortless. The same goes with potty training. We can get into all sorts of dramas on both sides with our children about it. -But until the time is right and they really get an insight about the whole process, then understanding the mechanics and the feelings of what needing to go to the toilet feels like just won’t occur to them. ← Too Much Choice! – Are Too Many Options Bad For Our Health? I really enjoyed reading this George. Makes me wonder about all the thinking I do around this about myself that I try to alter but never seem to succeed.